The look is contemporary and current, but it does not set the world on fire due to its design, that’s ok though, the buyer for this car isn’t exactly looking for that either. This new world market design puts the Cruze at an excellent position to conquer those buyers that are currently shopping for Japanese, Korean and other domestics. Fit and finish on the exterior of the Cruze is excellent, with tight gaps, smooth surfaces and good trim finish, even inside the doors and trunk. GM is betting that it is the attention to the details, driving quality and of course, the price that will bring new buyers as well as the faithful into Chevrolet showrooms. Once inside, you again, notice the fit and finish. The old GM had a knack of making even quality products look cheap, not so in the Cruze. This is a no-excuses interior that is well thought of and superbly executed. There are Chevrolet lineage elements in the blue-hue dash as well as the layout. Buttons and switchgear are well positioned and offer a quality feel to the touch. There is the ever-so-handy Bluetooth connectivity function that once you use it, you are hooked. Seats are comfortable and easily adjustable, even for the most finicky derriere. Rear seat is surprisingly roomy, both in leg and head room. A third person would have to be fairly small to be comfortable in the middle seat. Trunk is surprisingly large, with simple, yet functional padding throughout. Driving the Cruze, you quickly realize how quiet it is. Suave urban driving is easy, thanks to the smooth inputs from the pedals as well as steering feedback. Small sedans are not necessarily inspiring and involving to drive, yet the Cruze offers a nice dash and pinch of each of these elements. Acceleration to 60 MPH is in the high 8 seconds, with a slight whine of the turbo above 3,000 RPM line. The 1.4 liter, 138 HP turbo 4 cylinder can be a bit a nemic at times, especially when wanting to make something happen fast. Humm, I definitely can imagine this car with 178 HP. Handling is a nice surprise. The input and feedback from the steering and suspension are communicative and enlightening. We like the good looking alloy wheels as well as rear disk brakes offering on our test car. The thick, leather-rimmed steering wheel looks great and offers all of the needed controls to keep driving distractions to a minimum. With previous ho-hum designs behind them, Chevrolet has gotten its mojo back with the all new Cruze. It is good looking, comfortable and capable. With a complete array of standard features that are optional on other brands. 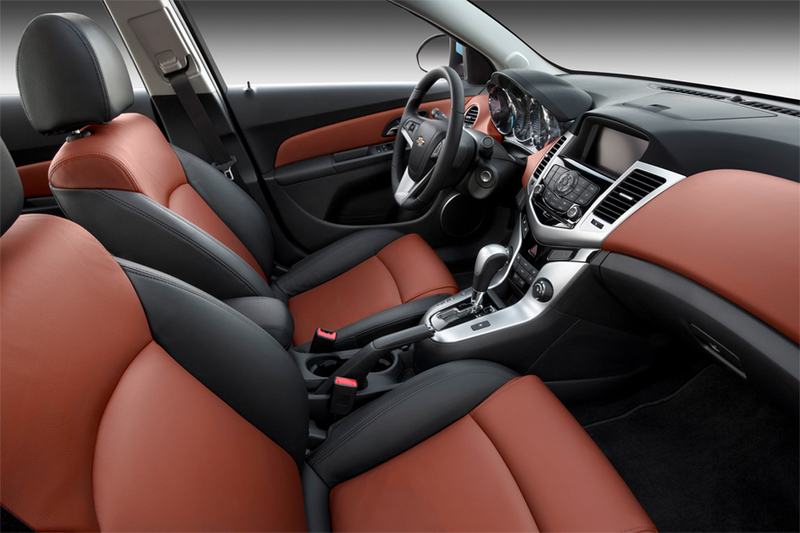 The 2011 Chevrolet Cruze should be on every small sedan buyer’s short shopping list.